Come join Tullow Ladies, new players always welcome. Training starts Wednesday 22nd August. Any questions just pm this page. Girls U14, U16 & U18.5Meeting in the clubhouse Tuesday 7th August at 7.30pm for all players, parents and coaches. 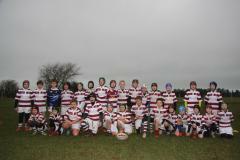 New players welcome for all age groups, no rugby experience necessory. Look forward to seeing you there. Congratulations to Anna Doyle and her teammates on the Irish U18 7's team who won the Home Nations 7's tournament in Birmingham today. They were unbeaten this weekend and saw England off in the final with a scoreline of 28-19. The future is very bright for women's rugby!!!!!! Coaches choice Best effort of the month for November. Our minis are bag packing in Dunnes Stores in Carlow 10am to 7pm from Thursday to Saturday this weekend, if you are in Carlow drop over to Dunnes and give them some support. All at Tullow RFC are right behind you @CooneyCiara keep breaking down barriers. All the best for the campaign.